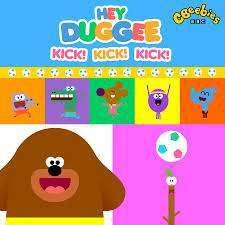 Help get Hey Duggee's KICK SONG to the top of the charts, by SHARING this summers Ear Worm. Love it or hate it, you're going to hear it a lot! I thought Shaun Keaveney on bbc6 came up with this as a joke! That's so funny, reminds me of 'Crazy Frog'. It would be more fun to make it the Christmas No.1 instead of the Simon Cowell effort. Then in years to come, people would wonder why a song about football was No.1 on Father Christmas's Birthday. Where can I download the lyrics? Embarrassing, can't believe they played that during World Cup coverage. It's literally infantile. What would you expect from a song made for infants? They mentioned this during the Belgium coverage, and it has been in my head all day. Well obviously, but infants aren't the target audience of world cup coverage and they spoke about it as if was a proper song for the world cup. That's the fault of the BBC not the song itself, and that's where my comment was aimed. Well obviously, but infants aren't the target audience of world cup …Well obviously, but infants aren't the target audience of world cup coverage and they spoke about it as if was a proper song for the world cup. That's the fault of the BBC not the song itself, and that's where my comment was aimed. It was said in jest, wasn't it? *I was only half paying attention at the time. It was said in jest, wasn't it?That's how I took it. *I was only half …It was said in jest, wasn't it?That's how I took it. *I was only half paying attention at the time. I don't know anymore. Very possible that was the case and I wasn't paying enough attention! I just thought at the time maybe I'm not 'down with the kids' anymore and that's what people listen to these days... Anyway, I think I'm over it.